Raja Ampat is a group of islands on the western tip of Papua in Indonesia, famous for its diving experience. Most of the world's coral reefs biodiversity and rare species of marine life can easily be found in an archipelago about the size of Switzerland. While there are 612 islands, there are four major islands ("Raja Ampat" means "Four Kings") that have a population center: Waigeo, Misool (which is home to ancient rock paintings), Salawati, and Batanta. Its location in Papua, one of the furthest places you can get to in Indonesia, may give you a head shake. But it's a diver's mecca that relatively advanced divers should not miss. The location of the islands, most of which are remote from the nearest towns, makes the reef pure and seemingly untouched. The wide area of pristine blue water contains millions of reefs and fishes, many that you will never find anywhere else. Above the ground, small but soaring islands invite you to climb their peaks, while in between your excursions the friendly locals or your crew will have fun with you. The area is much more popular with foreign tourists who seek adrenaline and natural tranquility, than with domestic ones. Raja Ampat district's capital is Waisai on Waigeo Island. This town is the starting point for exploration in the area, as it contains the district's airport and seaport. The best time to visit Raja Ampat is during the dry October-April period, which is by contrast the rainiest period in western and central Indonesia. Because of Raja Ampat's tropical climate, rain can unpredictably fall, although much less frequently during the dry season. It is still feasible to travel in other seasons, but the weather is often a toss-up: you can be under the sunshine while it is raining just past the horizon. Temperatures remain consistent throughout the year, averaging 25-32° C, but humidity may make it feel hotter. The nearest major airport is Dominique Edward Osok Airport(SOQ IATA) in the mainland at the city of Sorong. There are direct flights from Jakarta, Makassar and Manado, all of which are transfer points for international flights. Multiple daily flights also come from Jayapura, the largest city in the Papua province. Wings Air also flies from -0.4221130.77451 Waisai's airport to -0.89377131.289612 Sorong's airport daily 10:20 and from Waisai's airport to Manado daily at 15:05. There are daily ferry sailings between -0.887996131.2690123 Sorong's harbor ferry port and -0.4325543130.80318164 Waisai's harbor in Raja Ampat. Two types of ferries, an express or slow ferry, will get you there in 2 and 4 hours, respectively. As delays may sometimes occur, allow at least 2 hours to connect between the seaport and the airport. Tickets for both sailings can be bought at the wharf and the tourism office. From Sorong to Waisai, daily ferries depart at 09:00 and 14:00 (Monday to Sunday). From Waisai to Sorong, ferries depart daily (except Saturday) at 09:00 and 14:00. On Saturdays the Waisai to Sorong operates at 09:00 and 12:00. Ferries do not operate on Indonesian public holidays. The journey time is about 2 hours. Ticket prices are Rp120,000 for economy class and Rp240,000 for VIP. Speedboats can also be rented at a wharf about 200 meters west of the ferry terminal. While it's expensive and less comfortable than a ferry, it can get you there faster. From Sorong to -1.77125130.412555 Fatiga's harbor on the island of Misoul, K.M. Fajar Indah goes from Sorong to Misool on Fridays 23:00 and from Misool to Sorong on Saturdays 13:00. K.M. Fajar Baru goes from Sorong to Misool on Mondays 23:00 and from Misool to Sorong on Thursdays 09:00. As Raja Ampat is a designated marine biodiversity park, a permit must be purchased, so as to fund the park's conservation and to discourage mass tourism. The permit is valid for one year from the date of purchase. If you are joining a diving tour, most likely this permit will have been included in the price. But if it isn't, the permit can be purchased at the tourism office across the airport access road (open M-F 08:00-17:00) or at the Waisai Ferry port (open up to half an hour after ferry arrival). The fee is Rp500,000 for Indonesian citizens and Rp1,000,000 for foreigners-you only need a passport as proof of identification, children ages 12 and under are exempt. Payment in Rupiah is highly encouraged; payment in US dollars may result in an unfavorable exchange rate. Contrary to popular reports, a Surat Keterangan Jalan is not needed for visiting Raja Ampat, as it is a tourist attraction and far from potentially hostile tribal disputes elsewhere in Papua. Do also beware of scams for the permit purchase by only buying it at the designated locations. As the area consists of islands, the only meaningful way of travel is by boat. While there are no public boat services to the islands, your homestay or resort will usually arrange it for you for a fee. A general fee for Waisai - Arborek Village is about Rp 2,000,000. If you prefer to go on your own, hop on a Transwisata ship, charter a fisherman's boat, or seek a space in a boat bound for somewhere near the one you want, from the boat harbour at Jalan Abdul Samad Mayor at east of town. But even when you travel close, the price can range from reasonable to exorbitant, all depending on the supply of fuel at the area. 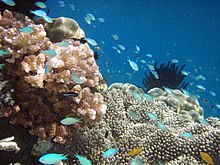 Raja Ampat offers attractions for both divers and non divers. As mentioned above, Raja Ampat is a diver's mecca! Travellers from around the world spend time entering this area of Indonesia to explore what nature has to offer. Millions of fishes and reefs are under the blue waters, many species that you cannot find anywhere else. One of the most prominent dive sites is near the -0.56508130.5181491 Arborek's village (Dive with manta Rays). where manta Rays are available in abundance. -0.57068130.659322 Kampung Yenbuba. . Dive with sharks and bump fishes. If you are not diving, you can still have fun! Walk the island, visit the villages, admire the nature, or snorkel and see the natural wonders! -0.56522130.272815 Pianemo (Pianemo), Fam Besar island (usually 1½-2 hours from Waisai by speedboat). Viewpoint for the karst landforms heritage site of Pianemo. 0.16612700584411130.039400853756 Wayag (Wayag), Wayag Island (usually 3½-4 hours from Waisai by speedboat, about 5 hr from Sorong). the Icon of Raja Ampat with an amazing landscape. However with Raja Ampat's natural conditions, high endemic level of land, sea biodiversity, coastal ecology, and local culture & tradition the islands offer more than just amazing landscapes to photograph. Buying handicrafts (noken string bags) from Arborek Village. On North and West Waigeo, you can see a traditional bamboo flute (suling tambur) performance. This traditional performance usually takes place during religious festival, on Independence Day (August 17th), and during visits from important officials or leaders. If you are interested in anthropology, this is something to definitely consider in your agenda. In East Waigeo, particularly in front of Urbinasopen and Yesner villages, there is a very interesting and unique natural phenomenon, which can only be seen every year-end. A light comes out from the ocean and wanders around on its surface for about 10 – 18 minutes. After that, it disappears and can only be seen again at the following years-end. Local inhabitants in both villages call this phenomenon the "Sea Ghost". This is more than just a sunset view, overlooking from your liveaboard. You may rent a small boat if you wish to stop and make personal discoveries along the line of the beaches. As the Raja Ampat Islands have four mountainous main islands and hundreds of small islands in their vicinity, you may want to take this opportunity to explore. In addition, the Karst area is a beautiful and original natural phenomenon, as it has various unique flora and fauna as its attractions, e.g., Bird of Paradise (Cenderawasih) Botak, Red Cenderawasih, Maleo Waigeo, Kus-kus, orchids, and palm. You can also trek around the islands to find hidden beauties, like waterfalls and ancient caves. In addition, there are also exotic locations such as the Ayau islands consisting of small islands on a very large atoll. Many islands in this archipelago have white sands with a large seabed connecting one island to another. But there are also islands with unique sands that the local community calls "zandplaat", which are a unique habitat for local vegetation. On these islands, mothers and children of local tribes collectively catch sea-worms (insonem). For diving enthusiasts the favorite destination is usually South Waigeo. But while you are here, why not take the chance to visit Kabui Bay with many karst islands, goa tengkorak (cave of skulls), and the historical sites of Raja Ampat in Kali Raja. You can see a variety of birds in Yenwaupnor and Sawinggrai village, the Salay dance in Saonek, and plaited handicrafts in Arborek. No visit is complete without visiting Arborek, where visitors can dive and watch groups of mantas & stingrays. In Sawandarek, there's a white sand beach with sea ducks and beautiful corals. In addition, there is a traditional village where you can walk around in and enjoy the unique slow paced atmosphere. US dollar is usually the form of payment at upscale resorts and liveaboards, but you usually can pay online if you are reserving a spot. Outside these areas, Rupiah is the legal tender. Banking facilities are very limited in the islands, though Waisai has Bank Mandiri, Bank Papua and Bank BRI ATMs. It's easier to obtain cash in Sorong through ATMs, but you are much better off to estimate your expense and draw your money before your flight. Do not expect much from using credit cards for transaction, those that accept will incur a service charge. A few resorts have a policy that your US dollars used as a form of payment must be in a spiffy condition (no tears) as they will exchange the money back into Rupiah. Everything is more expensive than in most parts of Indonesia due to its isolation. Resorts and liveaboards are luxurious with prices starting from hundreds of dollars while staying with a local often gets you below that. Dining services are provided by the diving organizer, and range from an international menu to fresh traditional food made by the local people. Naturally, there will be a variety of seafood dishes. Do try the fish soup. There's a local specialty called Sup Ikan Kuning (Yellow Fish Soup), served with local spices. The local home stays provide 3 meals a day which is included in the price. It includes fresh vegetables and fruits, tea, and coffee. Visitors who venture at Raja Ampat would usually spare at least a week to explore the extensive reef complex. Getting to the diving spots in itself can take up to half of your day and different diving spots offer different sensational landscapes and coral species. There are three general ways to stay here: liveaboard, resorts, and homestay. As the Raja Ampat Reef Complex is enermous, the liveaboard (live aboard a boat) is one of the best solutions. When your pinisi boat rests above a diving site, just splash down under. When you are done, the chefs will cook above the boat as you rest before your next plunge. Excursions generally lasts about a week or two. Schedules are often limited, you have to book months or even a year before! Raja Ampat Liveaboard, ☎ +62361282664, e-mail: dewi@raja-ampat-liveaboards.com. Provides 4 boats for your excursion. Wicked Diving, ☎ +6281239641143, e-mail: Indobookings@wickeddiving.com. 6-day excursion onboard the Jaya. The Seven Seas, ☎ +62361759588, e-mail: info@thesevenseas.net. Shakti Raja Ampat, ☎ +628124838873, e-mail: info@shakti-raja-ampat.com. Resorts are the most expensive place to stay at Raja Ampat. A one-week stay can cost from Rp20 million to Rp50 million. -0.417130.68733 Doberai Eco Resort, ☎ +6282112511763, e-mail: info@rajaampatdoberai.com. -0.770053130.7461234 Papua Paradise Eco Resort. And even though Raja Ampat islands have few visitors, there are already hotels and homestays on Arborek, Saonek, Mansuar, and Yenwaupnor islands. -0.5572130.67911 Kri Eco Resort, Kri Island, e-mail: info@papua-diving.com. -0.451637130.69216715 Raja Ampat Biodiversity Eco Resort, ☎ +6281248813677, e-mail: info@rajaampatbiodiversity.com. Find more informations on the "Stay Raja Ampat" website. Launched as Raja Ampat Homestays, Stay Raja Ampat is a non-commercial website built on behalf of the Papuan owners of the 36 homestays that are available in the islands. The site contains contact information for homestays on the islands of Kri, Mansuar, Arborek and Gam and provides comprehensive information for independent travellers to Raja Ampat seeking an alternative to foreign-owned dive resort accommodation. Raja Ampat is generally not recommended for beginner or inexperienced divers because of its strong currents, it is much helpful if you have a PADI diving certificate. If you dive, do the standard procedures, listen to your guide, and most likely you will be fine. Stick and stay along during the tour, do not stray especially if the current is strong. If you get hurt or get lost, help is usually very slow to arrive! Electricity outside the mainland is if any, limited. Generators are on from sunset until midnight, much less so if fuel supply is limited. Internet and phone connectivity is generally reliable at the mainland, although slow compared to world's standards. Elsewhere, mobile signal may be OK, but Internet connection depends on where you are staying at. Apply the leave no trace policy. Dispose of trash at the provided bins only. Do not take the fish or any natural items from the area. This city travel guide to Raja Ampat is a usable article. It has information on how to get there and on restaurants and hotels. An adventurous person could use this article, but please feel free to improve it by editing the page.